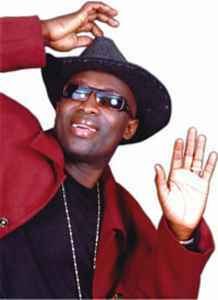 Adewale Ayuba (aka Mr. Johnson) is a Nigerian singer from Ikenne Remo, Ogun State. His band is popularly referred to as “Bonsue Fuji”. He is known for playing an evolved form of Were music or Ajisari called Fuji, which uses traditional percussive kettle and talking drums with an Islamic influence to call and response vocals.